The Intel Atom N475 is a small and cheap entry level CPU for Netbooks and small laptops. In the package is an integrated memory controller for DDR2 and DDR3 main memory (max 2 GB, single channel) and the GMA 3150 graphics card. Compared to the N455, the N475 is higher clocked and is specified for 6.5 Watt TDP instead of 5.5 Watt of the N455. The N470 offers only DDR2 support. The performance of the whole system (Atom N475 and integrated GMA 3150) is only sufficient for basic tasks like surfing the web, or office working. HD video, video cutting, advanced photo editing and of course gaming may overstrain the GPU and CPU. Compared to the previous Atom generation, the performance gain is said to be only marginally above a similar clocked Atom Z / GMA 950. An advantage of the interation, is the small overall power consumption of the CPU, GPU and memory controller (only 6.5 Watt TDP). Therefore, the chip is ideally used in small Netbooks, MIDs, and thin laptops. The Intel Atom N470 is a small and cheap entry level CPU for Netbooks and small laptops. 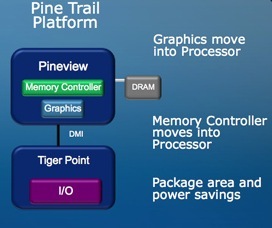 In the package is an integrated memory controller for DDR2 main memory and the GMA 3150 graphics card. Compared to the N450, the N470 is higher clocked and is specified for 6.5 Watt TDP instead of 5.5 Watt of the N450. The performance of the whole system (Atom N470 and integrated GMA 3150) is only sufficient for basic tasks like surfing the web, or office working. HD video, video cutting, advanced photo editing and of course gaming may overstrain the GPU and CPU. Compared to the previous Atom generation, the performance gain is said to be only marginally above a similar clocked Atom Z / GMA 950. Compared to the N450, the CPU performance is about 5-10% better on average.